Alright, going above and beyond this time around. I have two insert videos along with lyrics to mark the long-awaited Houkago Tea Time performance at the school festival. We knew “U & I” was coming, but the other new song turned out to be “Gohan wa Okazu” (Rice is a Side Dish). No joke! 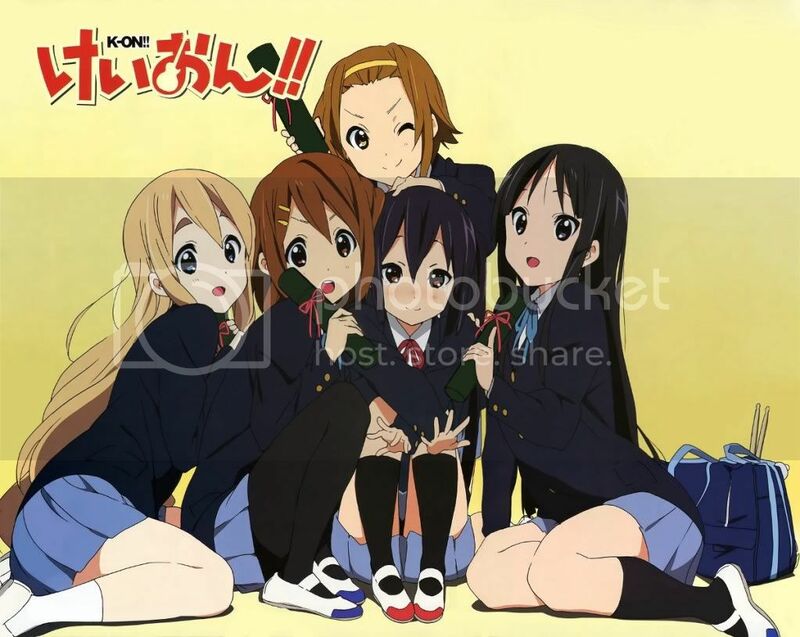 That makes two songs that Yui wrote lyrics for, one of which should is composed by Mugi. I thought the rice lyrics were supposed to be a joke, but it looks like the joke’s on me since they delivered an upbeat and lighthearted song with them. 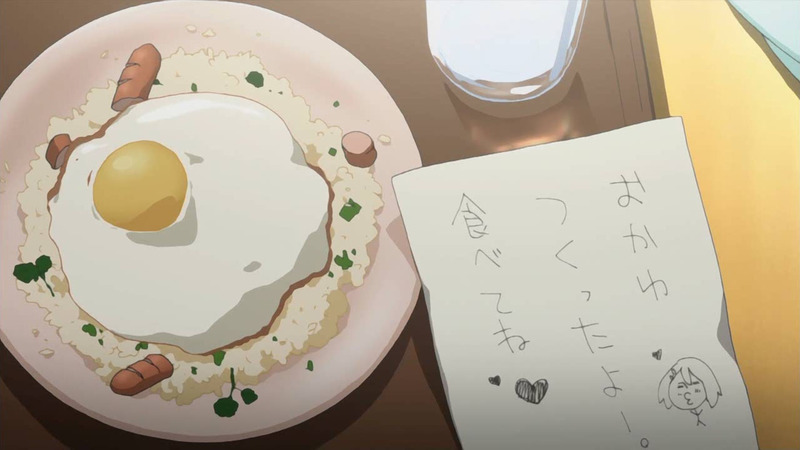 Humorous would be another good way to describe it, seeing as Yui’s singing about how rice goes well with anything, such as ramen, udon, and okonomiyaki, and how it’s a “dream-like collaboration” having carbs with carbs. I thought the stereotypical jab at how it’s got to be okonomiyaki and rice with Kansai people added some nice comedic flair, simply because they scream “donai yanen!” at the end that line. Watch (and sing along) below! ichi, ni, san, shi, gohan! In terms of the most touching HTT song, “U & I” delivers exactly what I was expecting when I caught a glimpse of the lyrics back in episode seventeen. We all know the song is about Ui, so I was glad the camera panned over to her in the audience during the performance of it. Despite how cheery Yui is singing the song, it was so unbelievable sweet that I felt some tears of joy on the verge of flowing out. The lyrics are so simple, saying how she can’t do anything without her, can’t apologize to her when she’s not around, wants to eat her cooking, hear her voice, see her smile, and how having her beside her gives her courage, yet I could just sense Yui’s earnest feelings behind them. All I have to be reminded of is how she stayed by Ui’s bedside writing them. 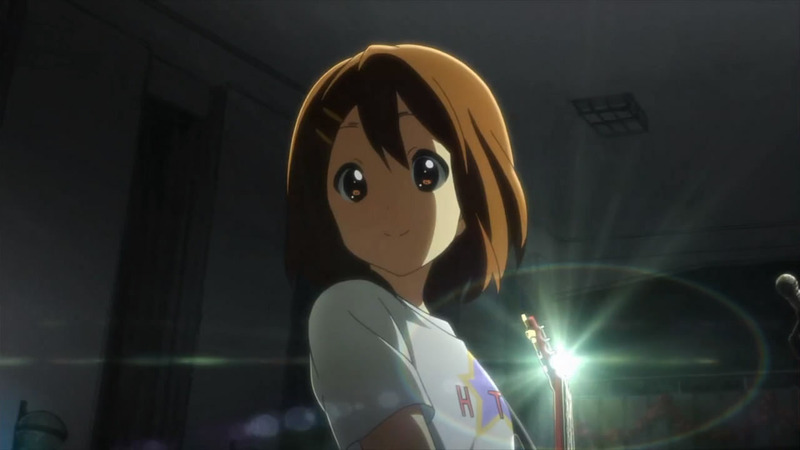 The line in the song about how she wants to convey these feelings and how Ui’s smile shines brightly even on rainy days was almost the breaking point for me, because Yui had finally realized how much Ui means to her and put those thoughts into this song. I’m admittedly a sucker for sentimental stuff like this, so it’s pretty easy for me to get caught into the emotions behind it. This is the last live performance (and song) of their high school years! See below. The only other song they performed seemed to be “Fuwa Fuwa Time”, but I was realistically only expecting one new one to begin with, making the two here quite a treat. 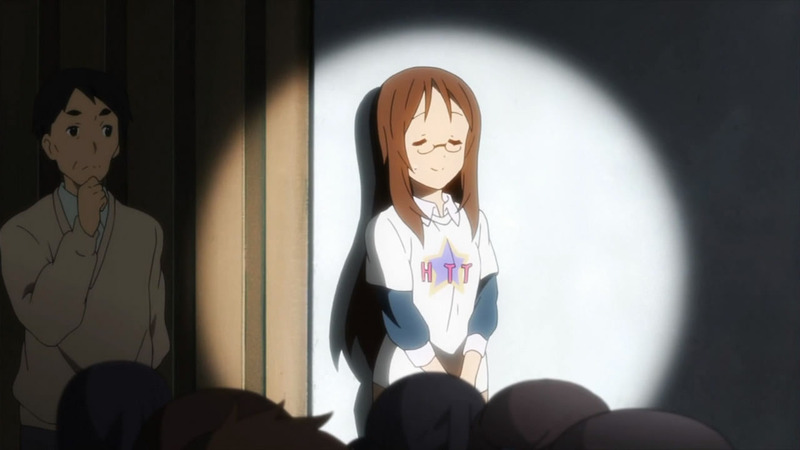 The episode itself was all about endearing moments though, with Sawa-chan’s big surprise of giving HTT t-shirts to everyone in the crowd being enough to get Yui’s waterworks going. 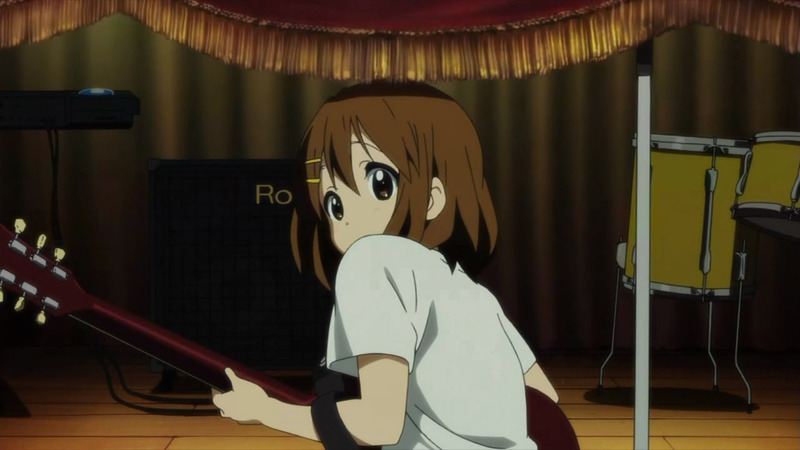 I love how Yui stumbled over her cord when the curtain raised as well, because it probably wasn’t as accidental as it seemed given the way it started her in the pose seen in the season two announcement at Yokohama Arena. 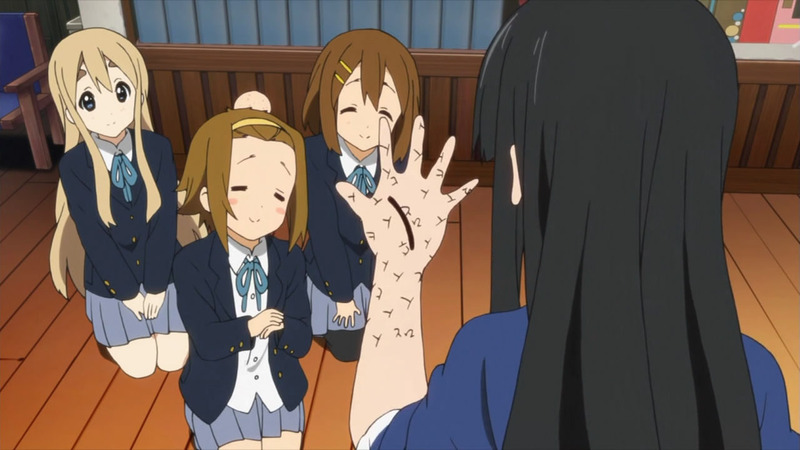 The lighthearted side that started off with creepy “person” kanji written all over Mio’s hand extended well into all of Yui’s quirky ad-lib MC that filled most of their stage time, which I didn’t actually mind because they brought in some “Romio” and “Ritsulet” lines to tie in the previous episode. 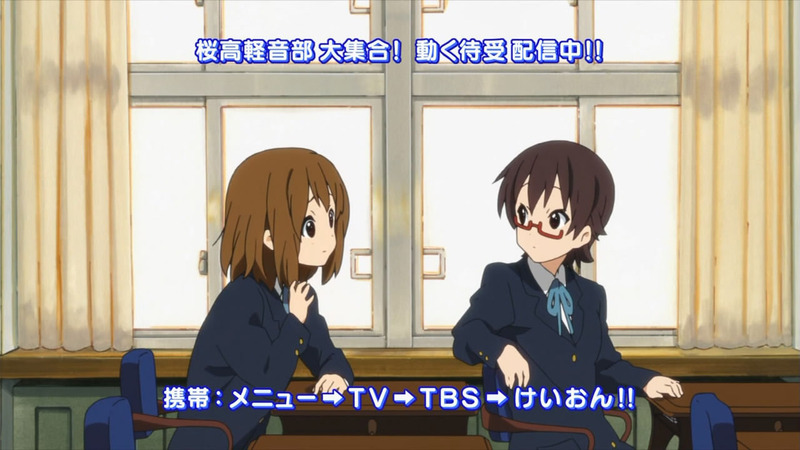 Yui even brought up her role as “Tree G”! If there’s one thing that her mic work reiterated, it’s that Yui truly does speak her mind without any sort of filtering first. Of course, that’s the reason why everyone loves her, as indicated by the affectionate way the four others introduced her to the crowd. 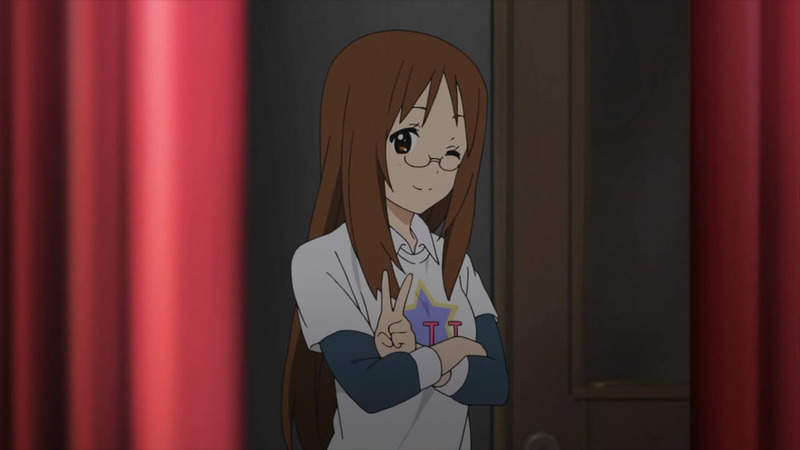 Similarly, I thought it was really sweet how Yui introduced Sawa-chan first and cute how she couldn’t get away from calling her that instead of “Yamanaka-sensei” until several attempts later. There was also her thanks to Nodoka for being the president of the Mio Fan Club that I thought was a very nice move on Yui’s part. 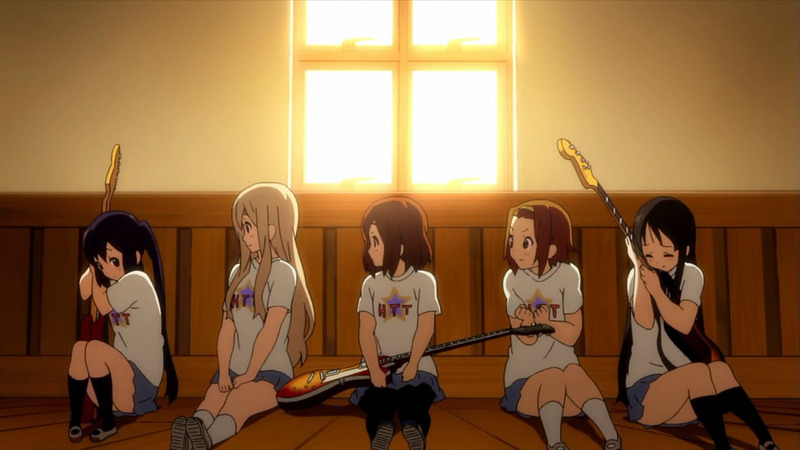 However, the bittersweetness wasn’t truly felt until the performance was over and the girls were reflecting on it in their clubroom. The eventual emotional outpour caught me a bit offguard, since Mio hugging “Elizabeth” and Azusa all over “Muttan” looked awfully cute just prior. I didn’t quite catch where all the talk of their next live that will never be was headed, so I was a bit taken back when all the girls started crying as well. It was like the last words at the Yokohama Arena live event all over again! 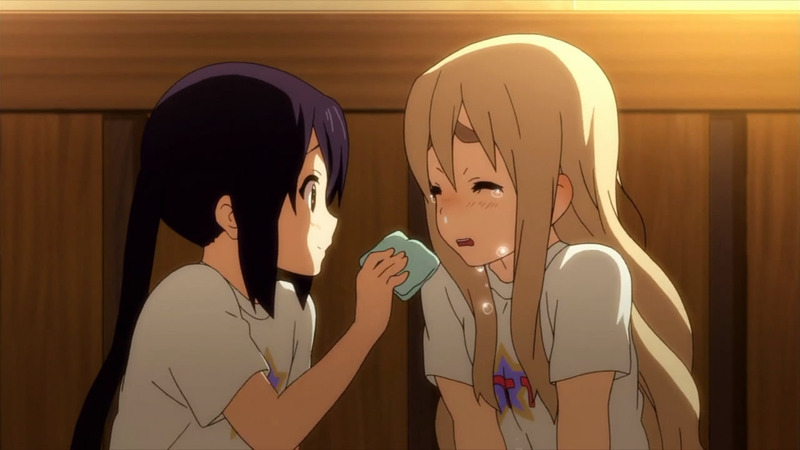 Mugi was ridiculously cute when she was flailing her legs out of frustration before Azusa comforted her though. I think the only thing missing to make their last school festival even more bittersweet was Megumi, who Nodoka said would be around to see their live but I didn’t catch sight of. 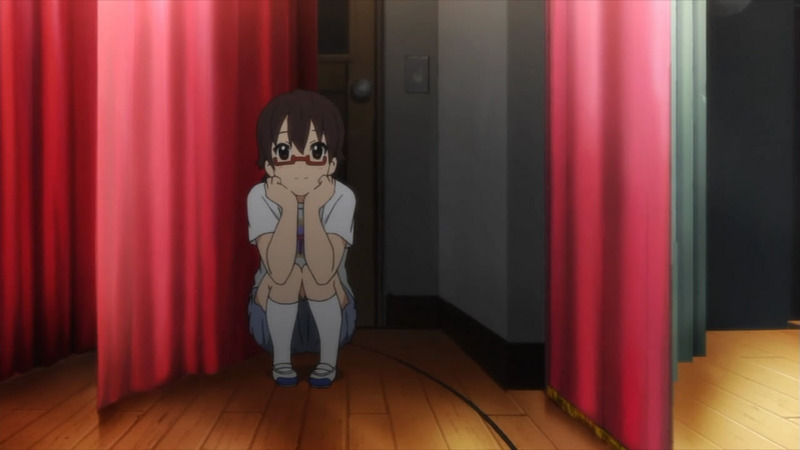 Megumi spotted! 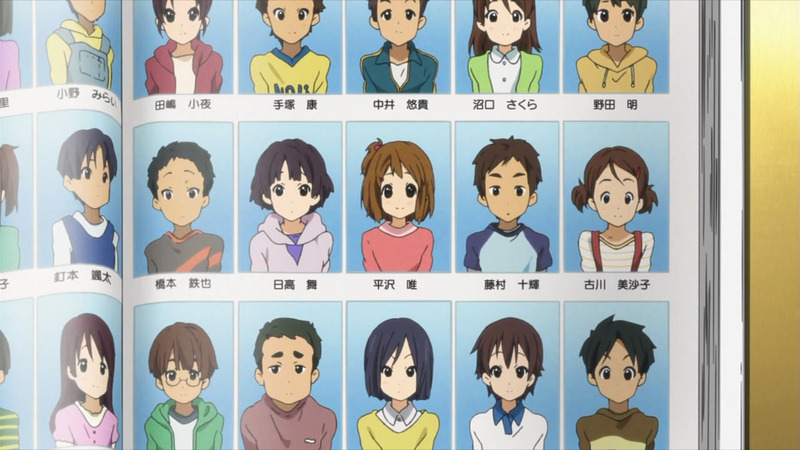 Yui and Ui’s parents too. 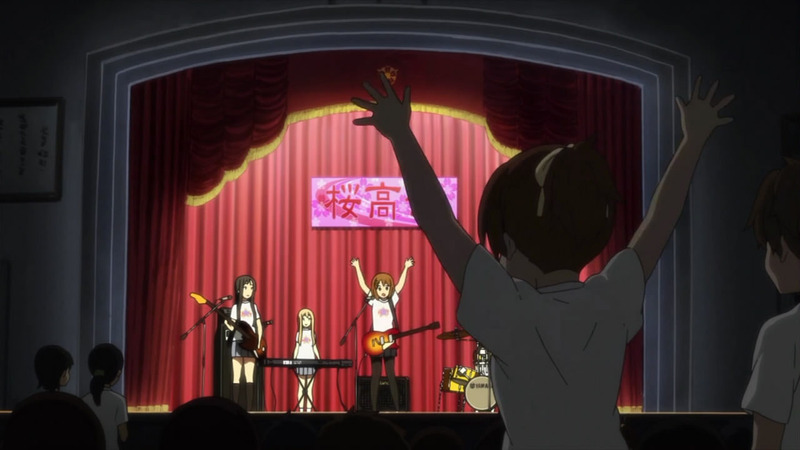 For now, I’m still holding onto hope that Kyoto Animation will surprise us with at least one more new song in the show, but they did deliver here in terms of providing “animated” performances. 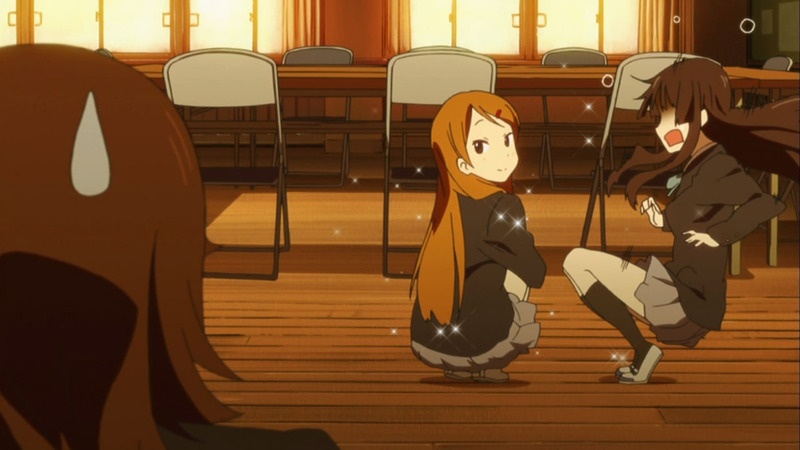 Next time, the focus is on grad photos it seems, with Yui spearheading that angle like she always tends to do. The end of the episode got me teary-eyed. I can’t imagine how the last episode is gonna be like. We definitely gonna ball out here. I’d like to think it’s still far away but being reminded it’s not for the past couple of episodes. 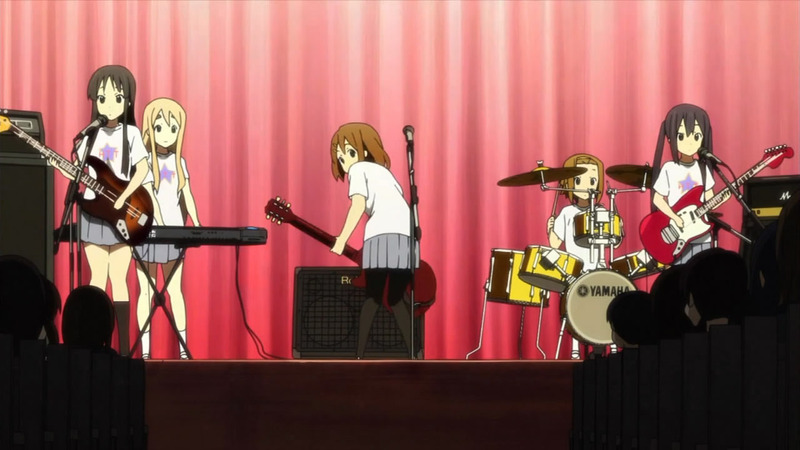 i’m sensing the last of one of the best anime i’ve ever watched… hail k-on!! 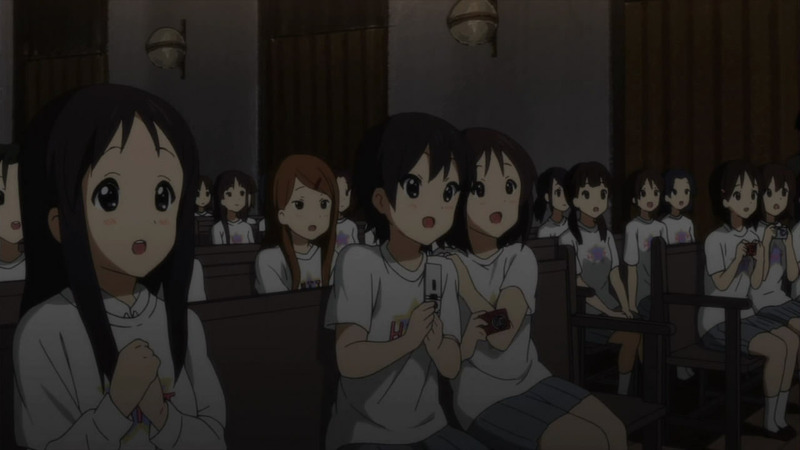 You can see Megumi was in seat, when Yui introduced Mio. Oh wow, they could have given her more focus than that. I see her though. Wow, she was really inconspicuous. I had to look up the episode and there she was sitting just behind the front row at ~11:47. 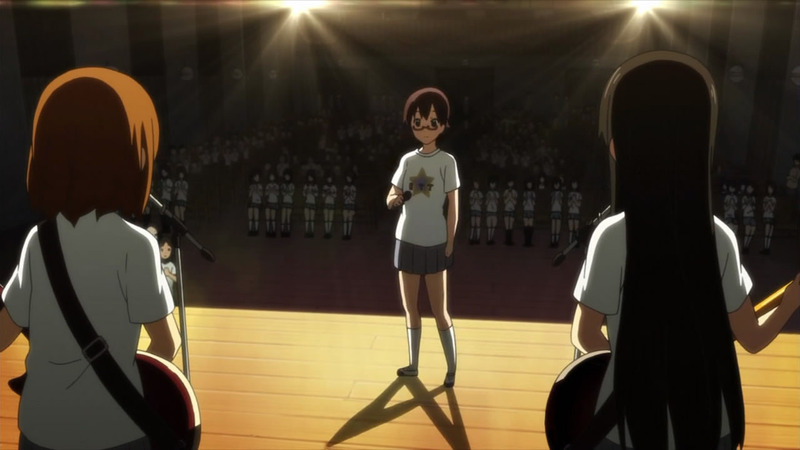 Their final school performance was pretty good and well animated compared to lasted season’s, and the ending was really touching. The site of seeing all the girls crying and tear eyed almost made me want to cry, and the transition from the end to the ending song felt just right. Drats! I was hoping to hear Honey Sweet Tea Time! The songs are still good though. A few more listens will probably get me hooked! As I was watching this episode, I couldn’t help but think the director/animators looked at their performance at Yokohama Arena and basically copied how the girls (and fans) reacted on stage and after. This isn’t a bad thing at all as the Live Event was a lot better than I expected with a lot of sincere and earnest feelings put out during the songs and particularly, as you already said Divine, the last words section. I don’t think the animation was quite as smooth as the worshipped God Knows performance, but it wasn’t too far off. It did look like they had mostly the correct hand positioning for the guitar chords/notes and did a few lip synced lines. This is not fair I had on queue this and rainbow. 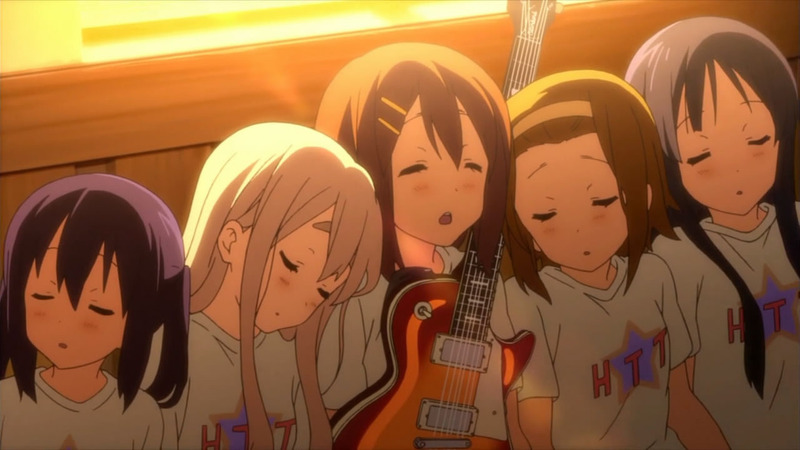 So I thought let’s go with rainbow first in case is sad, so I cry first then watch k-on and be all smiles…. 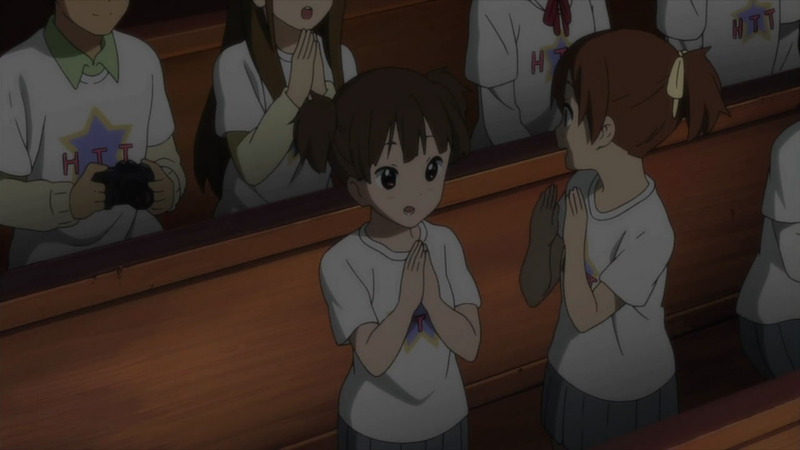 DAMN they trick me rainbow was light and fun and this… Oh my god once they start talking about “what’s next… Christmas… new year… I was in a flood of tears and so was Mio. 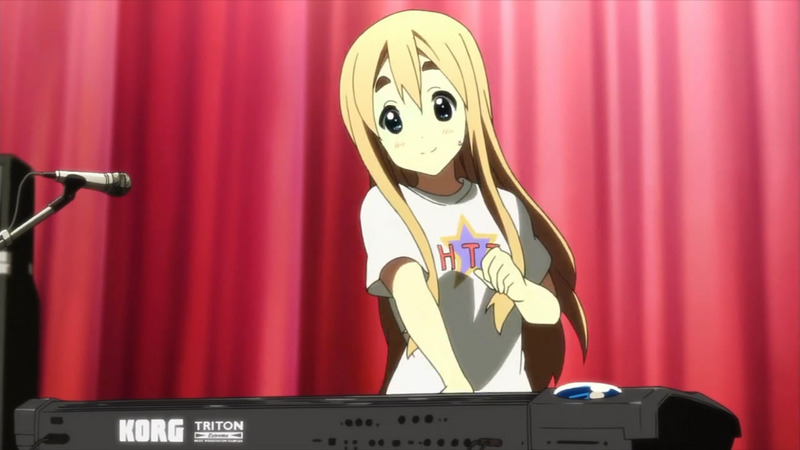 Then Mugi… I want my money back K-on is to be happy and they broke my hearth 4 episodes ahead of schedule! The song are nice! the whole show was great all the shirt. 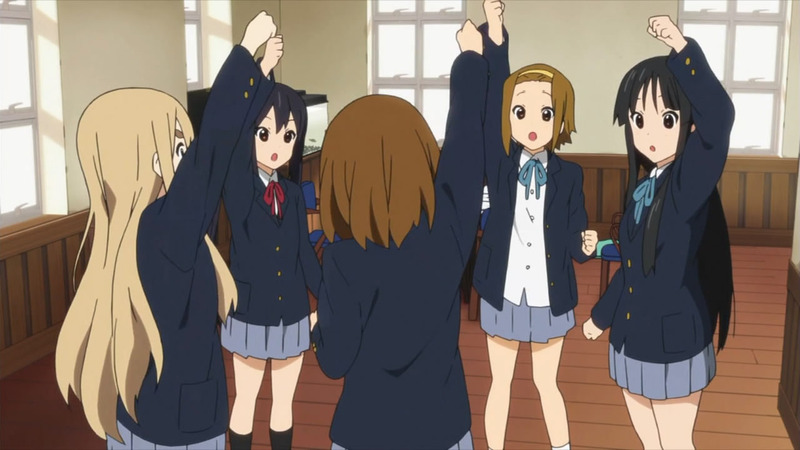 shouting their names K-on FOREVER! was i the only one extremely irritated by the excessive MCing? 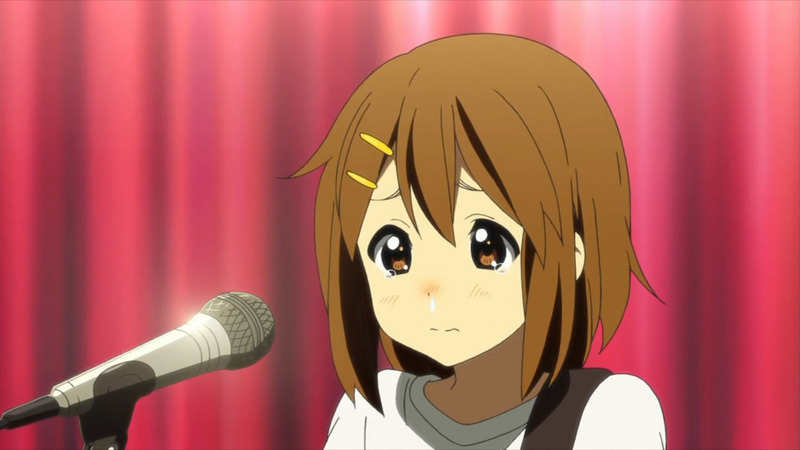 i wanted yui to just shut up and play already. to me it felt like kyoani ran out of worthwhile material and was just wasting time between songs this episode. 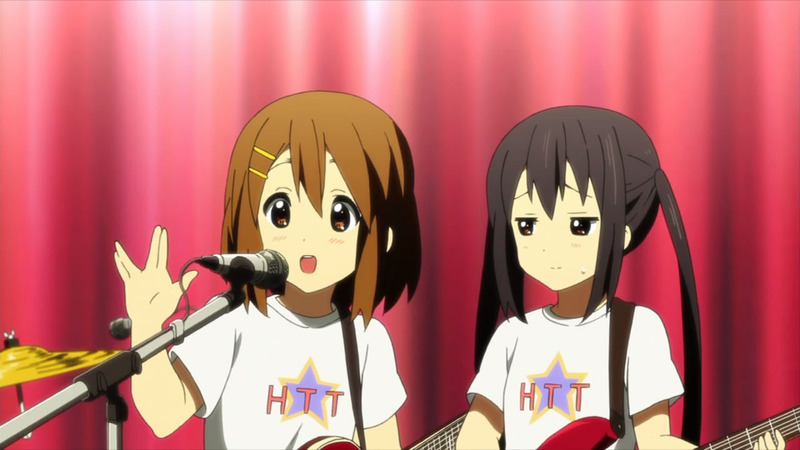 The way I interprate it was simply because with only three songs (unless they didn’t show others), Yui wanted the band to stay on stage as long as she could. I know she has this tendency to go overboard with her MC but I feel that’s the way Yui would think. even though they were practically there. A hint for those who read the manga while not spoiling it for the others. Speaking of which.. Quality.. I’m kinda surprised they didn’t hold back much. If the Budokan episode ever does come true.. I expect to be blown away. Everything was in place here. 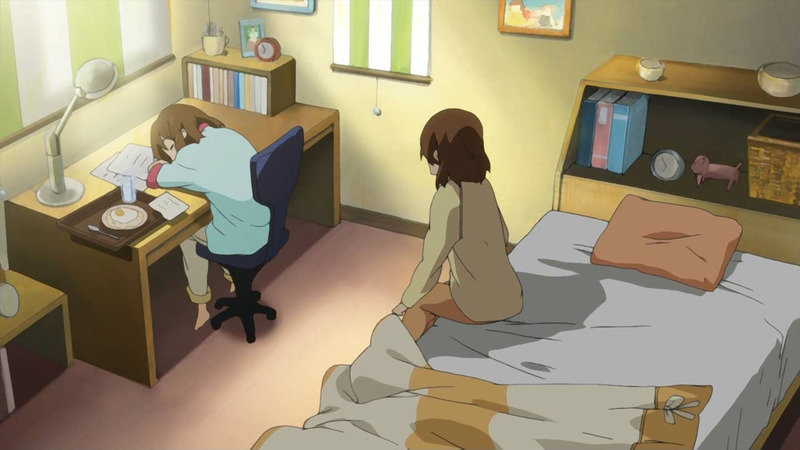 I liked how the at the last part where Yui says we don’t have time, it then goes to a view of her back. Felt like she was kinda sad about that. That was one brief and good scenario that I liked. Also them breaking down on the last scene was touching. It was sad when they were talking about the school festival plans. Also paying attention to what some of the people saw, at the last scene; 5 birds flew off. One /a/non from 4chan even suggested an even more depressing approach… 5 birds perched on a tree then 4 flew off while one is left. Seriously man even I would get even more sad if that happened. Kinda surprised Azusa didn’t cry.. But I guess she would get it at the last ep. 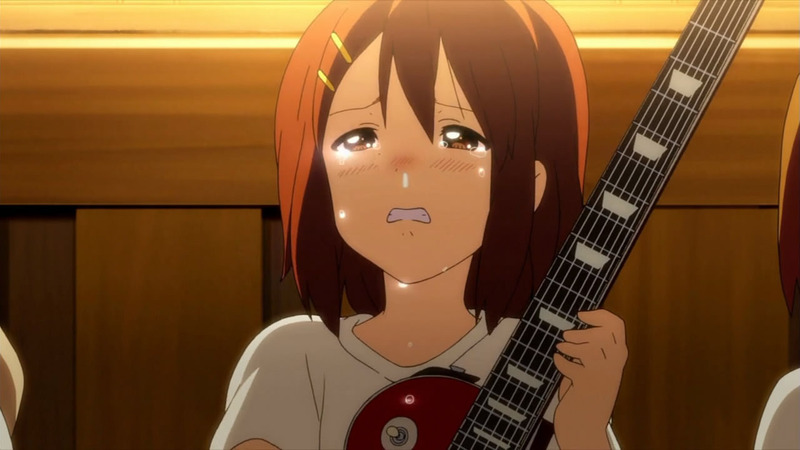 Yui cried but… I would’ve wanted to see the majestic crying yui from Newtype’s commercial. You think they had the long MC parts to heighten the anxiety about how much music they’re were going to play for the Live? Possibly, since that’s how it worked on me. It was a big dose of Yui at the same time though. Some people might find her annoying, whereas others just love that earnest behavior of hers, so it could have just been “Yui fan-service”. Haha. Even Nodoka was saying it. 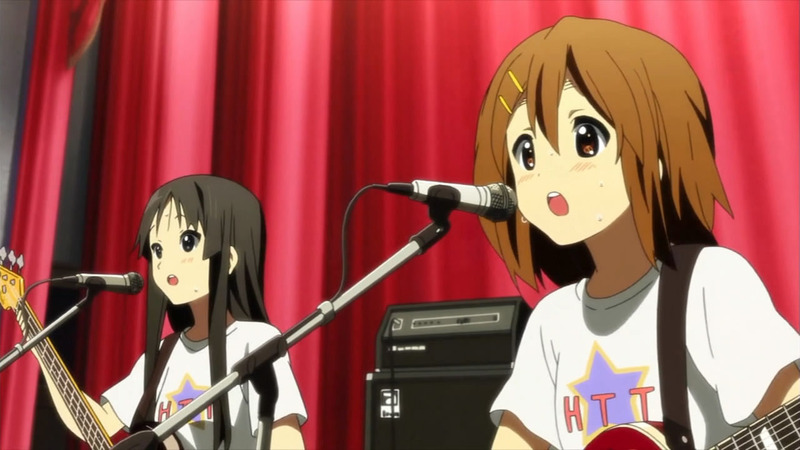 Yui was hella talkative in the concert. I’m thinking they played more than 3 songs there. 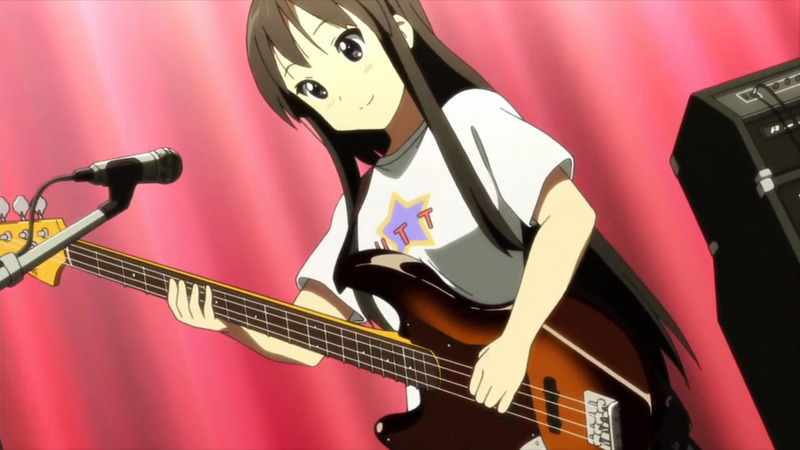 2 of Yui’s songs, the ever undying Fuwafuwa time, and also one of Mio’s song. 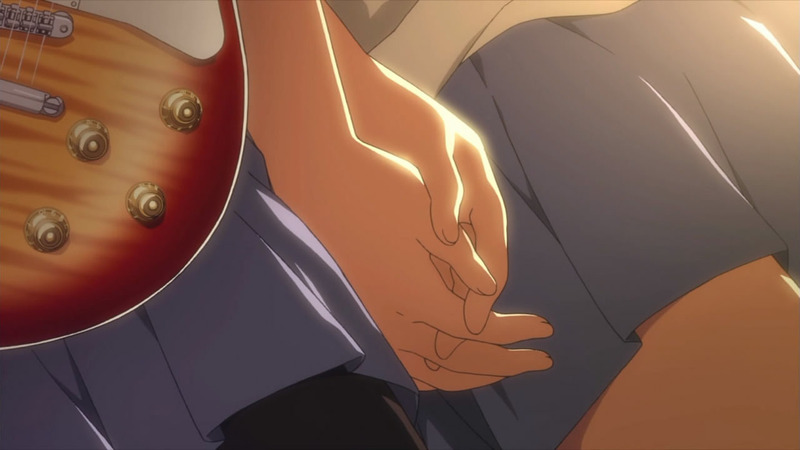 Although that is if KyoAni pulled it off we might see it in the mini Album they probably will release. Good catch about the birds, Megalith. I’m not sure which is sadder, the fact Azunyan is going to be left without her sempai or the sempai all leaving without Azunyan. Yea.. They’ve been pushing Azusa in the front more with her thinking about the future. After they graduate they’re heading off while she stays behind. This really took me back to the first season; the band forming and working their way up to their concert. The second season was getting a bit boring though, with no new songs or anything important happening, but this just blew me away. It was so entertaining to watch and well worth it. It’s one of those episodes that makes you look back at everything else and realize that it all led up to this. I really see them having a hard time topping this in the last episode, unless they get invited to Budokan. 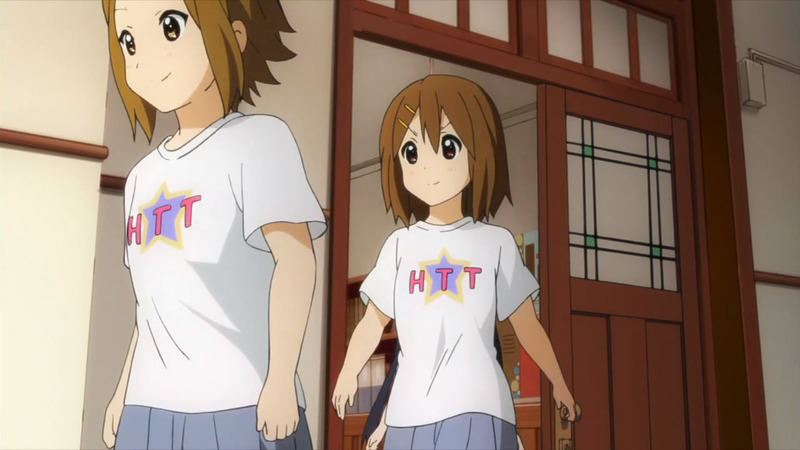 .. Also, Japan is going to sell so many of those HTT shirts. This is an “lol approved” comment. That comment made me burst into laughter like an idiot. GJ! Truly a Very Special Episode. The crying scene was unexpected, as it seems like something you would think would happen closer to the end of the series. I just find it agonizing that they decide now, of all times, to finally let their inner feelings out about how they’re not going to continue their band after graduating since it is, after all, just an after-school activity. T_____________________T It managed to bring me to tears too. KyoAni is pulling all the stops. There are only half-a-dozen episodes left. 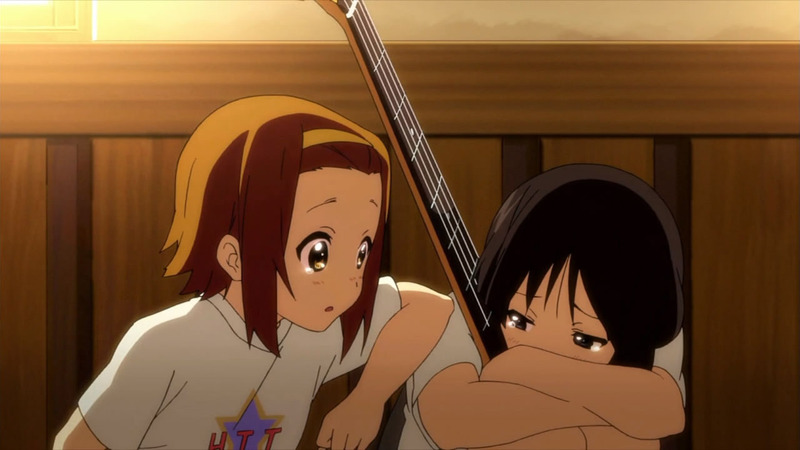 Looks like Ritsu lied when she assured Mio of two songs–only to realize they weren’t using Mio’s animal-crazy lyrics. You haven’t heard? KK released the subs earlier than Coalguys! 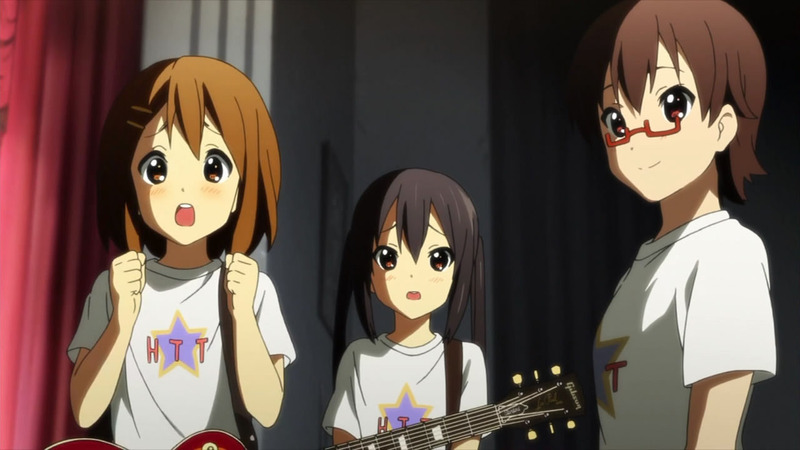 I loved this episode but I was sad that YUI sang the two songs. I wish that MIO sang one as well. Wow, the last part of this ep was rather touching. I shed some tears (I’m ashamed of myself for letting KyoAni do this to me again!). It’s the background music’s fault. Playing that background music during the girls’ tearful conversation is like foul play. If “Rice is a Side Dish” goes to #1 in the Oricon Music Charts then it will become the silliest #1 song in history and will confirm that Japan has gone down the dumps. That the generally tone-deaf new OP made it to #2(held back by SMAP’s new single) had me suspect that. Though, “Gohan wa Okazu” is better musically than the 2nd OP (the title which should not be spoken, most of all sung). With the exception of the latter (Korean band), SMAP will not be alone in attempting to stop the wave of Oricon charts being dominated by otakus flooding the market by buying every anime OP/ED single. I’m not even joking about that…2hrs of that too. My sisters, (4 of them) think I’m nuts when I get emotional from an anime. This time was no exception. 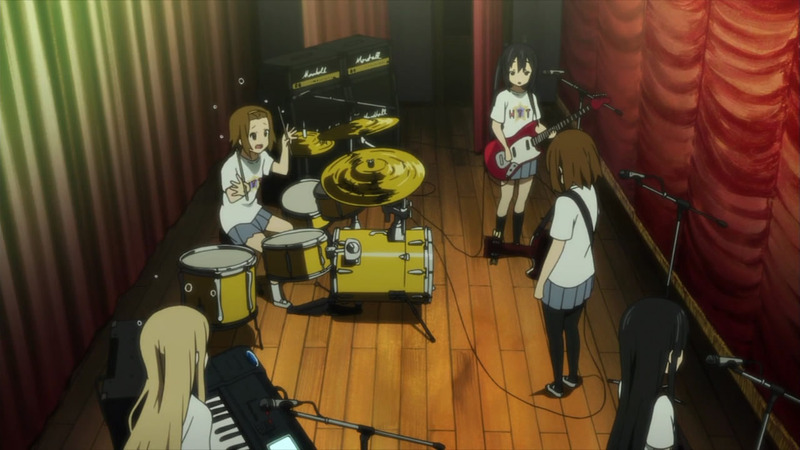 It’s been an hour since I watched the K-ON group scene toward the end and I’m still tearing up at thinking of it…I seriously thought only Key works would have me in this state, but this show did such a great job expressing so many emotions that I enjoyed from Key and appealed to a lot of things I love in anime in general. 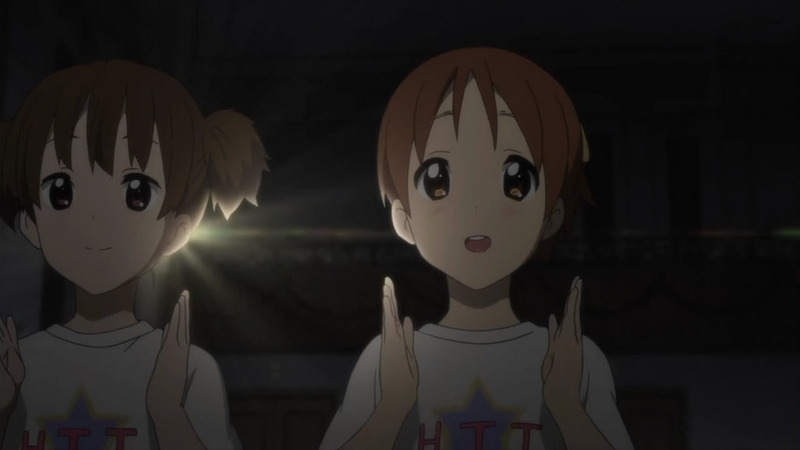 Their 1st live from S1 I will always enjoy the most (especially because of Mio! ), but this one will always have a tender place in my heart…Thanks Divine for always sharing your thoughts and feelings on this show and others by blogging. I appreciate it! *goes to comfort my cat who wept tears with me as I squeezed him really tight whilst I cried. * GO HTT FOREVER! is “mokei senshi gunpla builders” episode 1 blogged here…. Do you need to be taught how to use the search function and the RSS or are you purposely nagging? This episode was indeed one I won’t forget. I especially loved their little own groupies from their class. 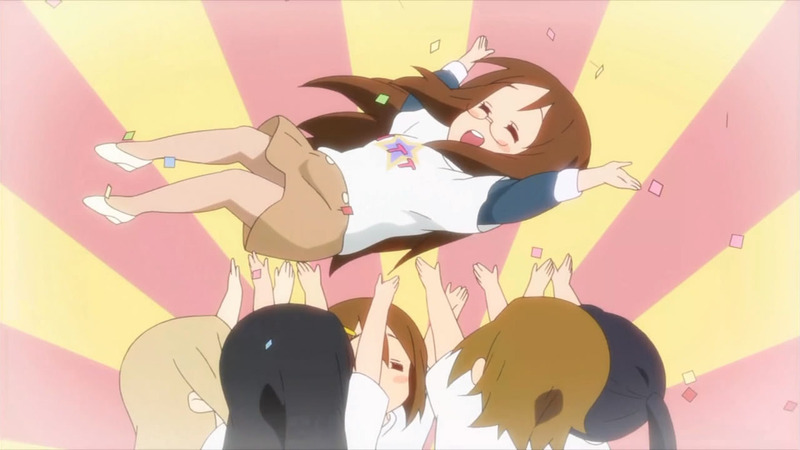 Seeing all the girls, minus Azunyan, break into waterworks made me cry! Haha oh gosh. 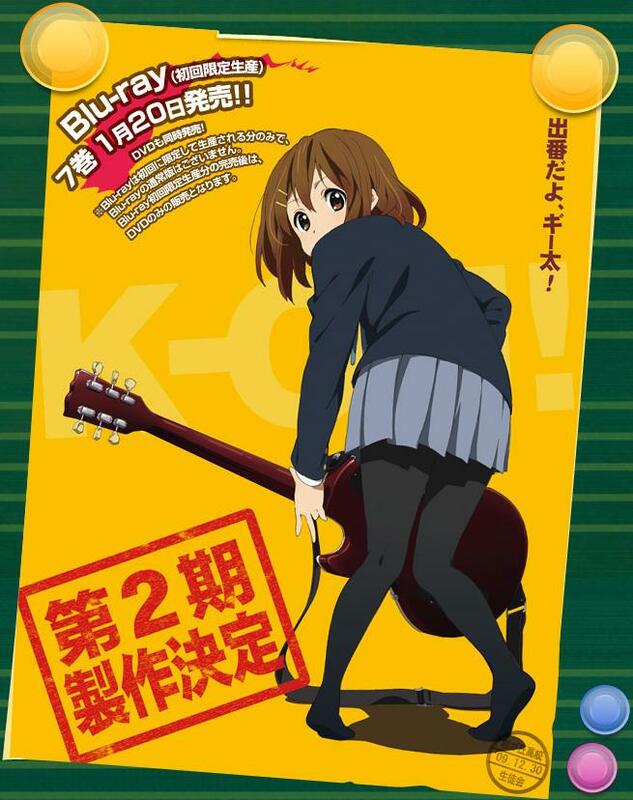 This is the series I always wait for every Tuesday to come out and I doubt there will be anything in the future that can replace it, unless they get smart and push for K-ON!!! (after years) Which i wouldn’t mind seeing them go on random car rides and play at underground concerts. WHATEVER! As long as I get my much need HTT dose every week. On a side note, Ui going gaga over her nee-chan had me cracking up. “SHE SAW ME!” This show knows exactly what to use to please their fan base. 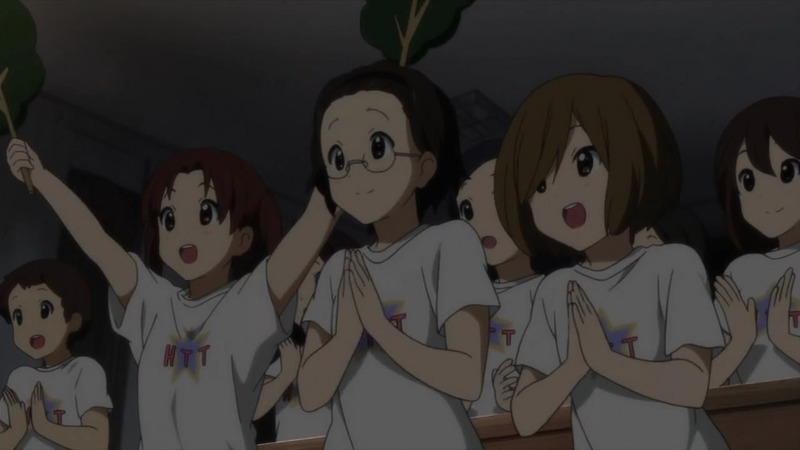 If they ever do make another Live Concert like at Yokohama, it wouldn’t surprise me if they had voice actresses dress as the classmates in audience along with the fans as well shouting for some more HTT! i felt sad when during at the ending part which they bearable can’t to be separate and go for their dreams of what to go after their graduation ceremony , i nt sure whether they go to the same university together as one team again in the university again.. The Rice is a Side dish lyrics were very LOL. Especially the part where she referenced the Kansai district. The preview of Yui’s photo’s were cute as well. On to next episode! i´m dumb. What the joke about Kansai district?? As mentioned in my post, it’s the stereotypical joke that they all eat okonomiyaki for their meals instead of rice just because it originated from there. For the seiyuus, this is the Yokohama Arena Live all over again. Especially Aki, who is clearly enjoying this. Odds are that she’ll gladly sign on for a second live gig in Yokohama with the new songs, volunteering as MC once again (though we must hope she does not hog the mic for too long like Yui does). 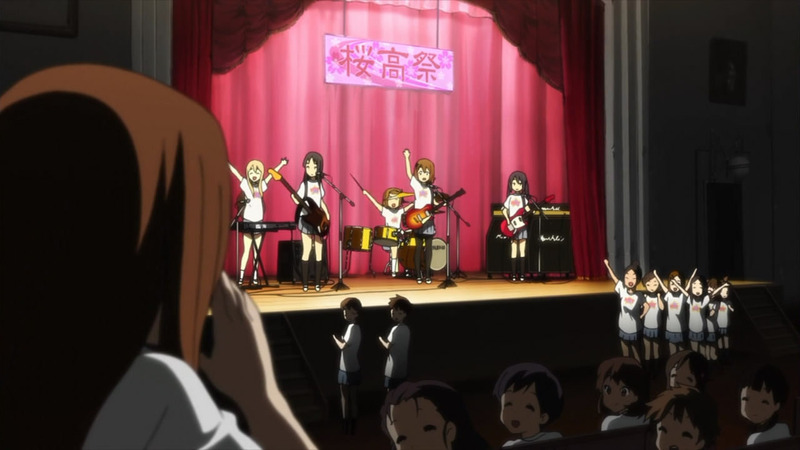 It was a moving bittersweet scene at the end to see the 3rd year girls realize that this is their last School Festival Live gig. Man, really put things in perspective does it. I’ve read this in my RSS feed, this morning I think, but didn’t even gave it a second thought. But reading this immediately after watching the ep, and after that bittersweet ending, give a completely different atmosphere. RIP Bice. That’s sad to hear… Last song she ever made got played. I know, I’m not gonna lie I like U & I better but that doesn’t make Bice’s Gohan wa Okazu any less of a beautiful song. She definitely knew her stuff. 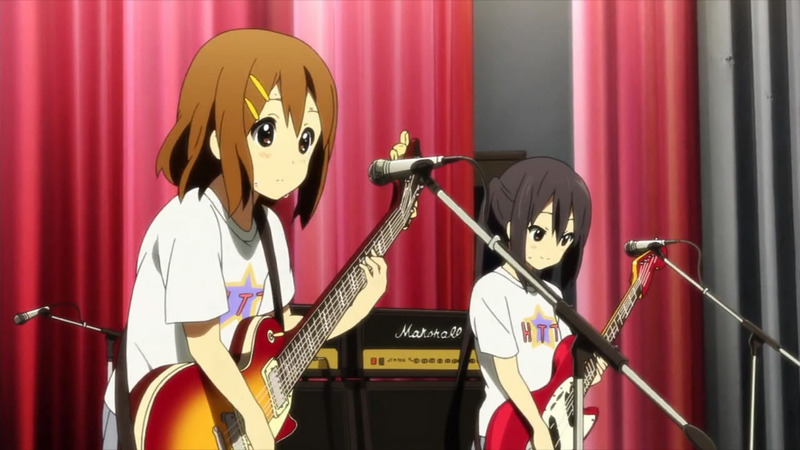 They could make a new season of K-On with the girls going to college and still having a band on the side and STILL go to Budokan. 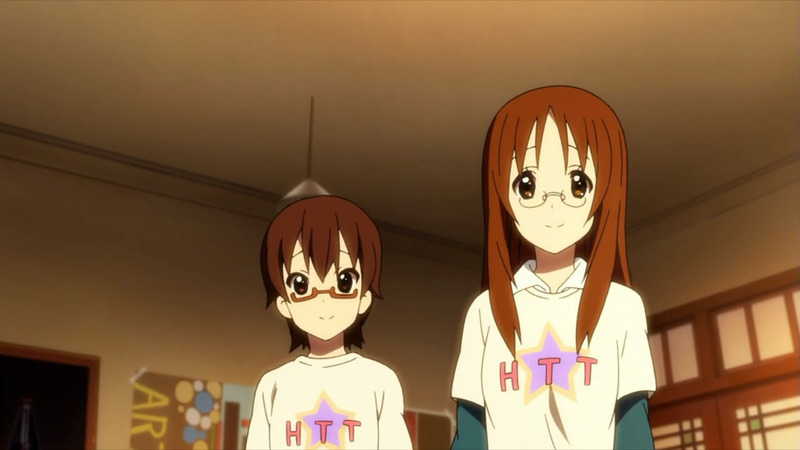 I MUST GET THAT HTT SHIRT NAO!!!! Support the girls! 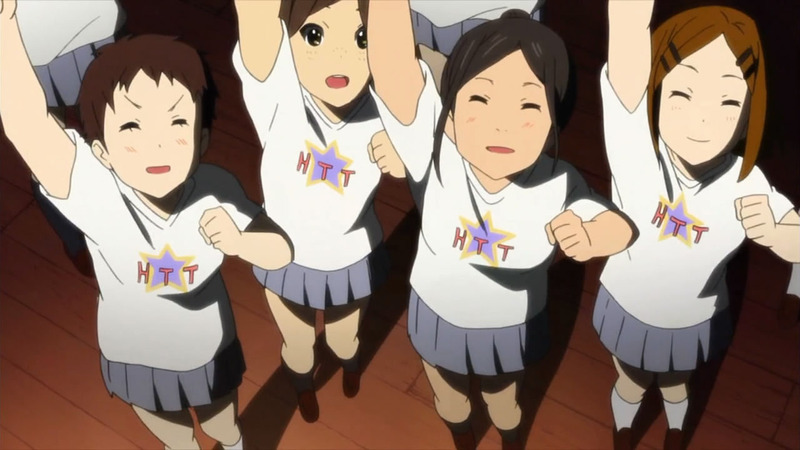 i must say, the htt shirt design in the manga is WAY BETTER than that in the animeXD the latter’s design was lame.. But you know, this was really well done. 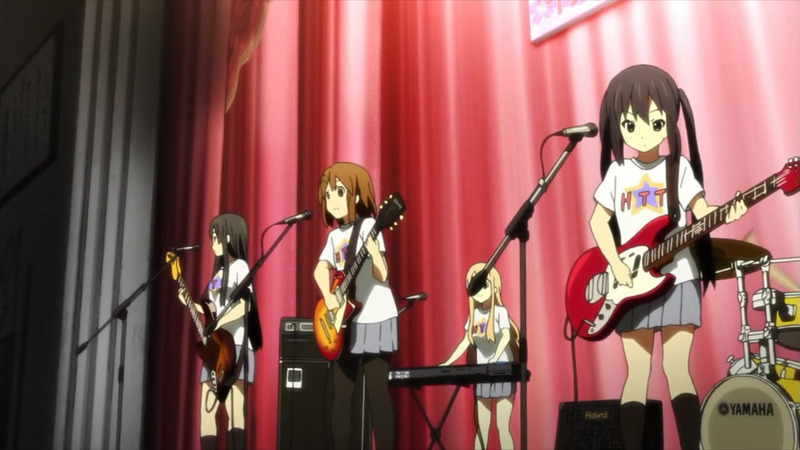 The live was exactly K-ON! style, and I am SO glad that they didn’t really start crying up on stage, that would have been so much less powerful. 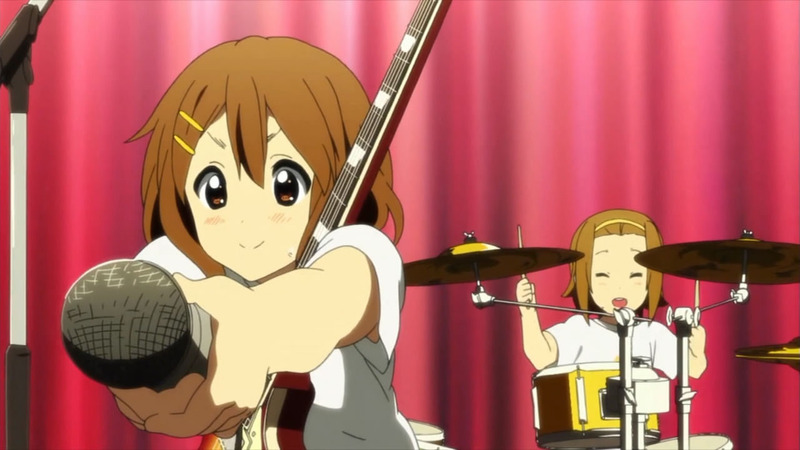 I loved both of the songs and even Yui’s crazy MCing. 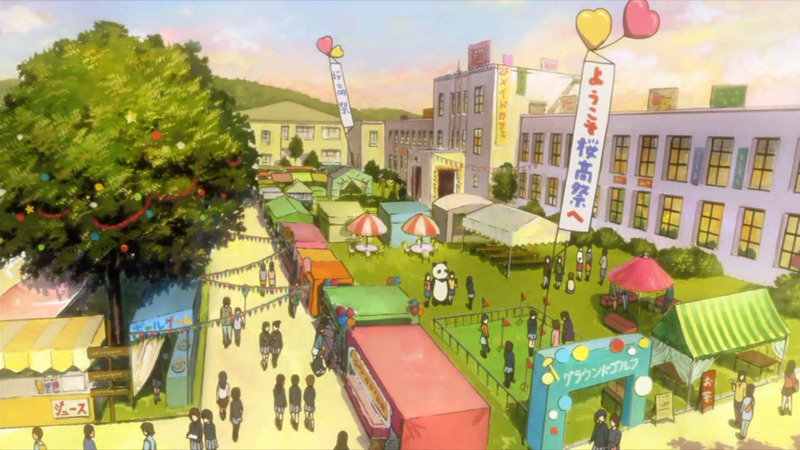 But overall, what made this episode wasn’t the performance, but the final realization of their graduation. I think I cried because it was so realistic. I’ll be a senior in high school this year, so I absolutely get where Yui and the others are right now, and this really showed it. It wasn’t corny, it was just raw emotions. 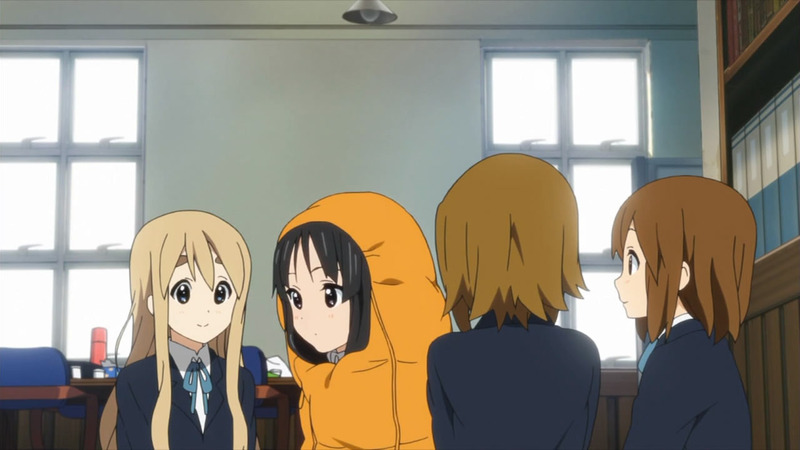 I loved how each girl reacted differently; Ritsu acting silly, Mugi throwing a slight tantrum, Mio breaking down in her arms, Azusa giving the seniors their moment, and Yui trying to speak for the group. KyoAni did the right thing by not mentioning the graduation much until the end of the series. So many series make that mistake. It’s “Graduation! Oh my God I’m going to miss you! Best friends forever!” wayyyyy before they even get there, and that ruins it and makes it corny. In real life, people put things off, like addressing their emotions, until a future moment when they can no longer avoid it. This approach made it almost as realistic and hard hitting for us as it was for them. 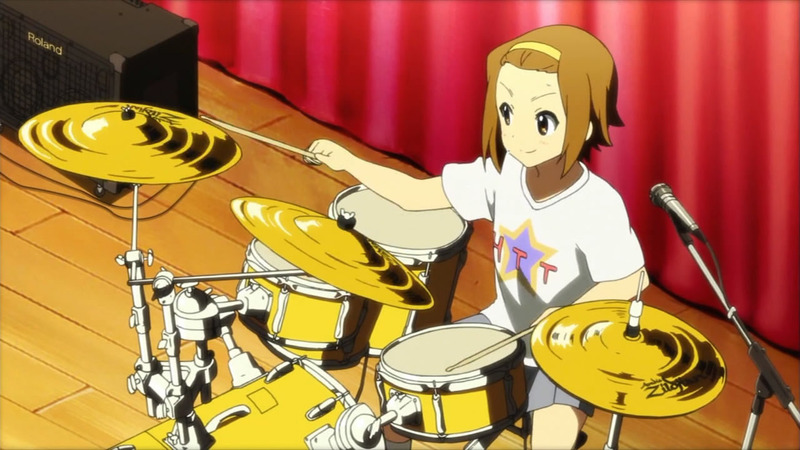 Anyway, one of my favorite K-ON! eps. Can’t wait for the next 6!! HO-KA-GO TEA TIME!!!! I’m going to be really sad when this ends. I like U & I better between the two songs=) but they were both good, of course. 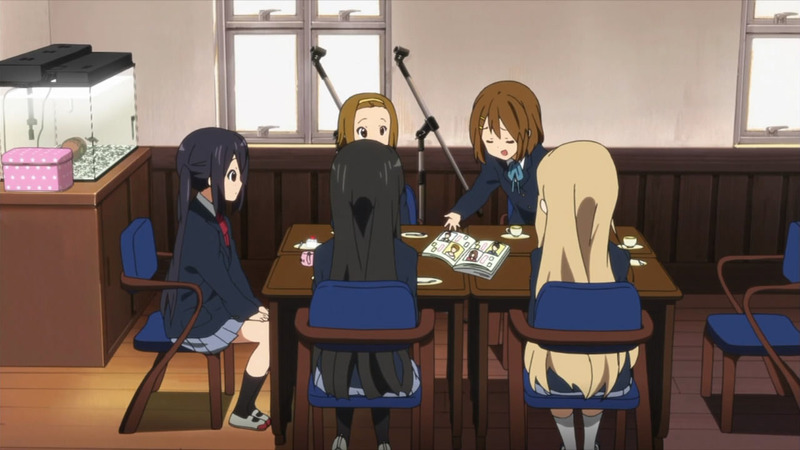 K-ON just does an amazing job building relationships that you don’t see in everything. 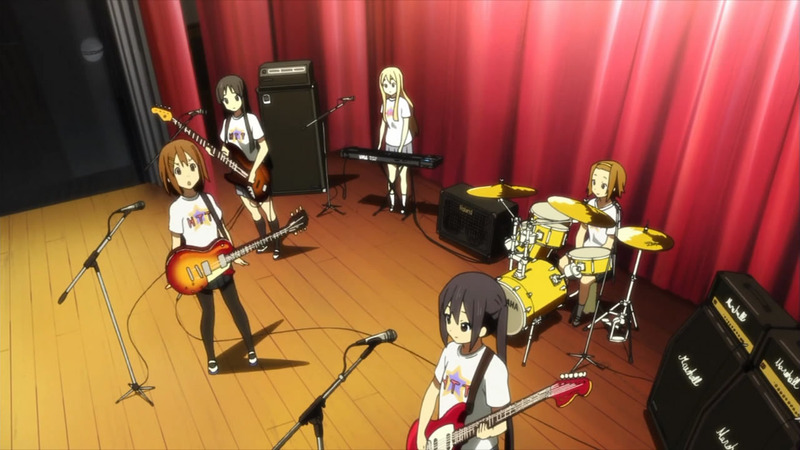 i can’t imagine myself without a dose of k-on! damn, it was the m0st tearjerker moment i’ve ever seen. *sniffles* i tried hard n0t to cry but i failed..completely..
yeah, mugi was so adorable as she flailed her legs..=3 i never thought seeing her in tantrums would be that cute..
You have to make a poll about who cried or not (lol). Put me in the yes column. I’m with everyone else that an emotional and teary episode suited this series well. It would be great if they can raise the level of drama even further, for example through a sad event. Perhaps Mugi’s parents dying in a plane crash (like Kotomi’s in Clannad), or Mio having a terminal condition (like in Air), or even Yui dying suddenly, and everyone continuing as a band in her memory, maybe even with Ui starting to take some of her older sister’s former role (Cross Game). Ichi Ni San Shi GohanN!! This song is so much better than U&I even though U&I was touching. 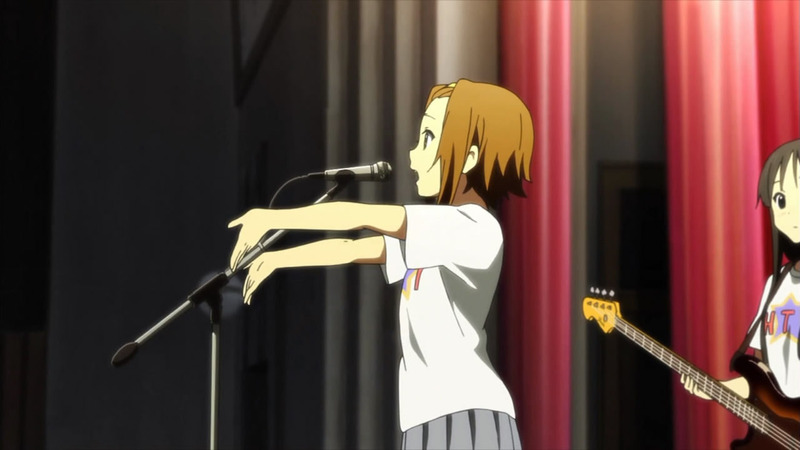 That pose Yui was making when the curtains rolled up was the same as it was advertised, lol! yeah, i noticed the resemblance t0o..
Mantears we’re filling up but none were shed. Wish I could have watched this without worrying about “other” things. 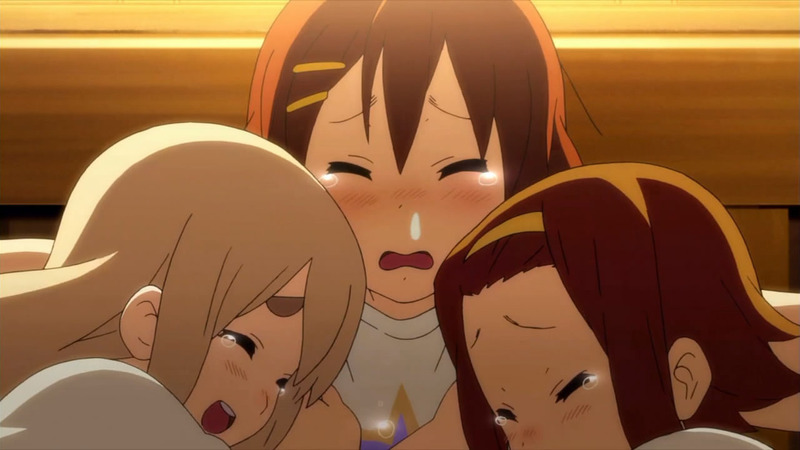 But even Azusa didn’t cry this time. Which is rather hard to understand, considering that she burst into tears on her first day with the club, over the little fact that they were having tea instead of practicing.